The Schleicher ASK 23 is a single-seat Club Class sailplane that was built by the German manufacturer Alexander Schleicher GmbH & Co. 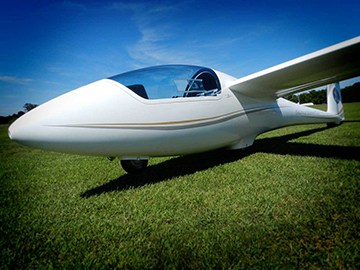 It was the last glider to be designed by Rudolf Kaiser. It is an early solo sailplane with docile handling, and it was a successor to the Schleicher Ka 8 and ASK 18. It is also the single-seater counterpart of the two-seater Schleicher ASK 21 with a similar cockpit layout. It uses glass-fibre reinforced plastic and ‘honeycomb’ as its main construction materials. It has no flaps, a nose wheel and a fixed main-wheel with a tail-skid or optional tail-wheel. First flown in October 1983, the initial version allowed for heavy pilots, with a maximum cockpit weight of 140 kg (310 lb), reduced to 120 kg (260 lb) in the later ASK23B version. 51 planes of the original version were built and 102 of the ‘B’ version.